Asia is a superb travel destination among the lovers of overwater bungalows and resorts. In recent years, the number of people spending their new year in Asia at an overwater bungalow and resort are rising. 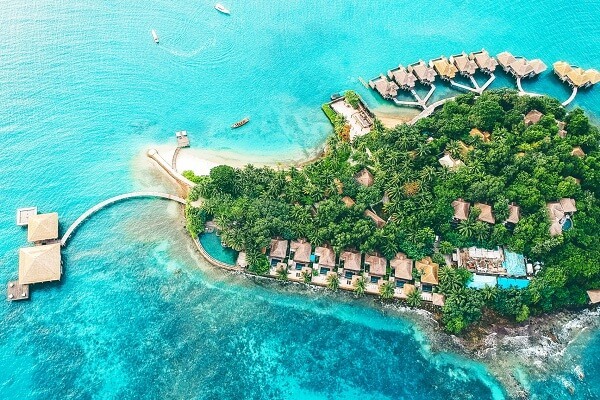 Asia New Years Eve 2019 is around the corner and most of people want to have a nice new year holiday at one of the best overwater bungalows in Asia. After our extensive research and reviews in consideration, we have compiled a list of beautiful overwater bungalows for the celebrations of new year’s in Asia. If you are looking for one of the best overwater bungalows in Asia for your new year holiday, then Song Saa Private Island is a good choice. The distance between Phnom Penh and Song Saa Private Island is just 202 km. It is one of the best water villas in Asia for new year 2019 celebrations. They offers one of the best hospitality in Asia. A special new year party is being organized each year. Nearest International Airport: The nearest airport is Sihanoukville International Airport (KOS) and most of international flights arrive to Phnom Penh (PNH) – a 3.5 – 4 hour drive. You can arrive in Phnom Penh and take a trip to Sihanoukville and then by speedboat. By speedboat: Song Saa Private Island is in the Koh Rong Archipelago, Cambodia – a 45-minutes speedboat ride/trip from Sihanoukville Port when you arrive from Sihanoukville International Airport. Check out exciting deals for Song Saa Private Island from this page as only a few villas are available for new year dates. 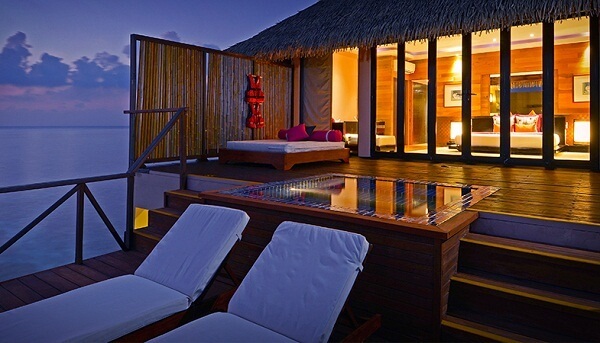 Adaaran Prestige Vadoo Maldives requires no introduction to any guest who loves overwater bungalows and water villas. It is one of the best overwater bungalows for new year holiday in Asia. They organizes one of the best new year’s holiday plan for your stay. They covers every important thing to make your new year vacation memorable and excitement. A special cocktail, gala dinner buffet, live band / DJ music, competition, balloon dance with countdown, midnight snacks, special champagne, new year breakfast, and much more. To know rates for new year dates and get quick deals for your holiday, then visit this portal / website by clicking here. Only a few villas / overwater bungalows are available for new year holiday week. From Male to Resort: To reach Adaaran Prestige Vadoo Resort from Male International Airport, you have to take a private speedboat for the 15 mins ride to reach here. After resort reservation, you can ask for the same from the resort well in advance. Taj Exotica Resort & Spa is a special new year party destination in the Maldives. They offers an amazing view of the sea, and crystal clear beaches. A special dinner on new year may create last long memories in your mind and heart. A special new year drink, with premium wines may create amazing new year party environment with your loved one. 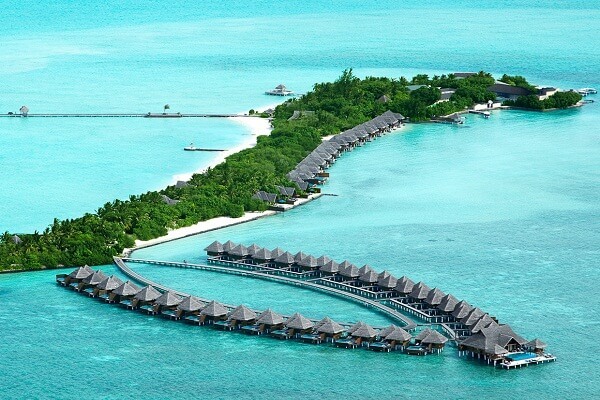 Only a few water villas / overwater bungalows are available. It is one of the best overwater resorts for new year vacation in Asia. From Male International Airport to Taj Resort: To reach Taj Exotica Resort and Spa from Male International Airport, you have to take a private speedboat to reach here. After resort reservation, you can ask for the same from the resort well in advance. If you are looking for best deals, then click here to get amazing deals for your new year holiday. In recent years, Philippines is taking number of new year’s party goers especially to it’s beautiful capital Manila and other important travel destinations. This beautiful resort is one of the best places to celebrate new year in Asia. If you are on a budget, then it is one of the cheapest resorts for overwater bungalows and water villas in Asia for new year’s celebrations. A special round trip land and boat transfer available from Busuanga Airport to the resort and vice versa on request. To reserve / book your overwater bungalow at the cheapest rates available, then visit our recommended portal at the earliest. The number of available water villas are less for new year holiday week. Nearest International Airport: Ninoy Aquino International Airport (Manila International Airport). From Manila International Airport by Seaplane: You can arrive at the Manila International Airport. From Manila, take a private sea plane to Huma Island Resort & Spa which may take up to 1 hour and 20 minutes. This can be booked directly online with seaplane providers. From Manila International Airport by Flight and Boat: From Manila, take a direct flight to Busuanga Airport through any airlines company (Cebu Pacific, or Philippine Airlines). From Busuanga Airport, you have to travel about 1.5 hours of land travel to Sagrada Port followed by a 30 mins boat ride to the resort. It is one of the best overwater bungalows in Asia for New Year’s Eve 2019 celebrations and amazing moments. A wonderful place, good food, nice chef, best view from your own room/overwater bungalow (all rooms offers seaview). 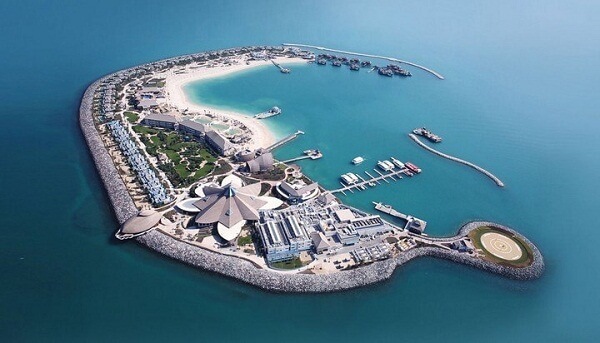 It’s a nice new year’s destination in Qatar. A special barbecue feast and further unforgettable surprises for your family and loved one. It’s a popular choice among the people of Qatar and foreign tourists. From Doha International Airport: To reach Banana Island Resort, please take a car transfer and then boat ride at an additional cost. To arrive by helicopter from the airport, you have to reserve your VIP journey 72 hours prior to arrival. To reserve your overwater bungalow at the best rates available, then visit our recommended website at the earliest. 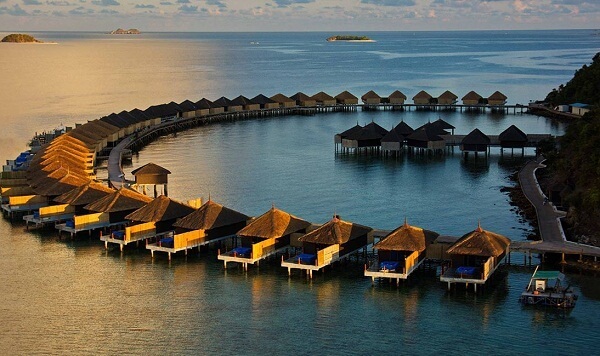 The number of available water villas are few, you have to be quick. 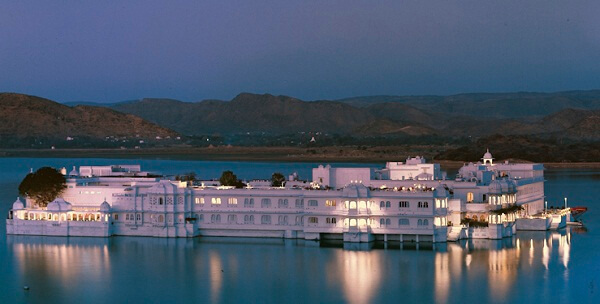 A beautiful and marvelous overwater luxury heritage hotel, located in Udaipur, India. The restaurant on the roof is a good choice to spend your new year evening with your loved one. A flying lantern is a good choice to see beautiful sky from the restaurant on the roof. Do not forget to enjoy early morning prayer from the mosque to feel the magical moments. You should have to book restaurant table very early to get the confirmed table. The hotel will try to make your stay memorable and happy! Check hotel rates and deals from here. International Airport: Jaipur International Airport, Jaipur, Rajasthan, India (Distance: 393 km). To reach Jaipur, a train is available from Udaipur. Alternatively, you can reach by car or govt public transport (not recommended), or private luxury bus (recommended). Most of popular travel destinations in Asia offers amazing opportunity in celebrating new year especially island destinations. However, most of tourists book their overwater bungalow/resort room well in advance. It’s quite difficult to get overwater bungalow in last weeks of new year celebrations. Hence, an advance reservation is required to get the confirmed stay. Article first published on October 18, 2018.